This entry was posted in Uncategorized and tagged Alone in Berlin, Berlin, Culture, Failure, Journalism, Kate Ferguson, Life, Reflection, Success, Writing by Kate Katharina. Bookmark the permalink. What a kaleidoscopic view of your life in Berlin! 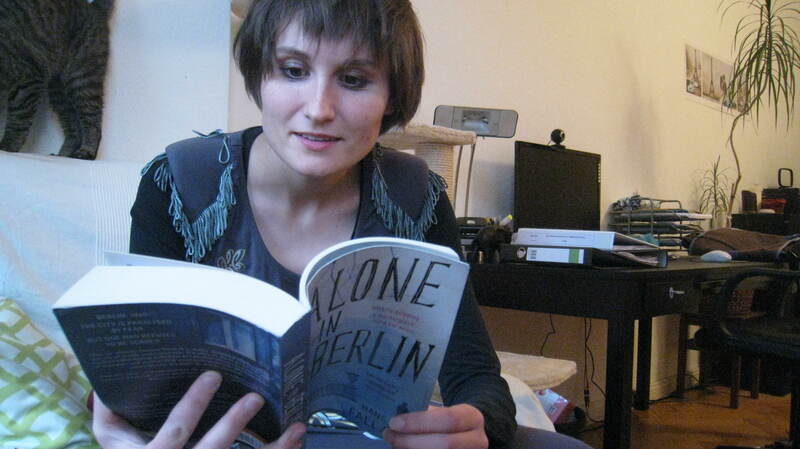 At times disjointed but still all part of the picture that is your life “Alone in Berlin”. Should dreams stay dreams if their fulfillment is followed by emptiness? Loving this series! Just as a matter of interest – if you said “yes” to the Roma girls’ question, what was it they were doing with the clipboards? When I’m out and about in far-off lands and people approach me and pester me, I always speak back to them in Irish. This has the desired effect of wrong-footing them and they turn their attentions elsewhere. It’s also very funny but try to keep a straight face until they can’t see you. Then you can have a good laugh! Thank you so much, Prasina. What an entirely excellent idea! I will have to try that and do my darndest not to laugh. Once, when I was little I was on a slow train in Bavaria with my older sisters. We were sitting near a group of Americans and decided we would speak Irish to each other for the duration of the long and dull journey. The Americans listened to the curious sounds and concluded that we were speaking a native Indian language. We giggled and kept going. Hi lalynne! Thanks for stopping by! That’s kind of hilarious about the “Merciful One”. Perhaps they are Vietnamese. I’ve been told that’s it’s the “Chinese Mafia” but I’ve no idea! How about you pop me an email at ferguskk@tcd.ie and I can give you all the info about Spiegel! Are you thinking of applying yourself? Feels bitter sweet these observant wanderings, maybe thats my age though, I’m past the age of wanderings, I’d rather my home comforts. Are you going back to Ireland soon? Your dreams change as you get older so what you achieve now will be replaced soon with something else. Life will always be exciting as long as your open to new things. Sometimes they are lonely but they also make me feel more alive than ever before. Could I ask how old you are? I was convinced before I moved that I couldn’t live without my home comforts and I will feel that way again but for the time being, I am excited about new things. I have no idea what I’m doing. I am leaving Belrin at the end of June and spending July in Vienna. After that, there is a chance I’ll move to Edinburgh with my boyfriend, but it depends on whether I get a job in Berlin. It’s a strange feeling, not knowing. What are your plans, for after the Masters? Will you stay in Manchester? I just got 78% in my MA, one module left, the dissertation. Wow, Vienna, the little known home of the Croissant. I’d like to go there. Also Edinburgh is super fabulous. I think you’ll go from strength to strength. Also home comforts are always nice! I like your part 2 and I learned one thing – you can pose quite well in the pic. Did you set a self-timer? Have you thought that the emptiness of achieving your dream stem from the fact that the excitement of achieving it is over? And you are looking for the next challenge to be stimulated? It’s the same whenever I have done an excellent job of analysis and then when the next few challenges are not as exciting, I feel somehow not satisfied enough. Any thoughts? Yes, it was a self-timer job. A bit embarrassing.. but on the other hand, I am “alone in Berlin” so at least it’s authentic! This is a great post! It perfectly captures how you can be in a city and still be alone. It’s fun to observe such a diversity of people! Thanks so much for your lovely, thoughtful comment, Janyaa. Your experience in Seattle is one I’d love to have in Berlin. It’s a strange feeling to be so vaguely connected with the outside world (through blogging, Facebook etc) yet so utterly physically alone and without a friend to meet for a coffee. Something to learn from. I wonder what it is about fearing success.. are we trying to spite ourselves or are we simply staying grounded? Certainly something backwards in it, but maybe we are simply acknowledging the emptiness in some of our dreams..